By Keith Cowing on December 31, 2009 8:52 PM. "Astronauts, researchers, educators, senior government officials including the director of NASA's Ames Research Center, Dr. Pete Worden, and the head of the FAA's Office of Commercial Space Transportation, Dr. George Nield, and representatives from commercial space companies and the Commercial Spaceflight Federation, will be among the speakers at the Next-Generation Suborbital Researchers Conference on February 18-20, 2010." When Does a New Year Start On-orbit? By Keith Cowing on December 30, 2009 10:35 AM. "Last week a Russian spacecraft ferried three astronauts to the International Space Station to join the two who had been manning it since October. The crew took Christmas Day off to share meals together. What about celebrating New Year's--how do you pick the right moment when you're hurtling through time zones at 17,500 miles per hour?" By Keith Cowing on December 30, 2009 10:09 AM. "Without mentioning NASA findings, Perminov said that he heard from a scientist that Apophis is getting closer and may hit the planet. "I don't remember exactly, but it seems to me it could hit the Earth by 2032," Perminov said." "On Friday, April 13, 2029, Apophis will pass Earth within the orbits of geosynchronous communication satellites. It will return for another close Earth approach in 2036." "Updated computational techniques and newly available data indicate the probability of an Earth encounter on April 13, 2036, for Apophis has dropped from one-in-45,000 to about four-in-a million." Keith's note: I certainly hope that Perminov gets some slightly better data before his people start to plan mission trajectories - a good place to start is to get the right year. By Keith Cowing on December 29, 2009 12:00 PM. "The University of Colorado at Boulder has been awarded $840,000 from the National Science Foundation for students to build a tiny spacecraft to observe energetic particles in space that should give scientists a better understanding of solar flares and their interaction with Earth's atmosphere. Known as the Colorado Student Space Weather Experiment, or CSSWE, the instruments package is expected to weigh less than 5 pounds." By Keith Cowing on December 28, 2009 2:07 PM. Keith's 23 Dec note: IV&V had an unexpected visit from NASA's Chief of Safety and Mission Assurance Officer Bryan O'Connor today. He relieved Butch Caffall immediately of his duties as Facility Director of NASA IV&V and re-assigned him to NASA HQ "to work some technical issues for NASA starting early in January" according to an internal memo. Greg Blaney is acting IV&V Program Manager and IV&V Facility Director. IV&V employees had been expecting something to happen but this action was more abrupt and sudden than had been expected. According to a NASA IV&V engineer: "The immediate re-assignment of the NASA IV&V director represents the end of modeling of NASA projects as part of our IV&V analysis. We have endured four years of spending IV&V funds on, what has been from the onset, an R&D effort to create a new method of doing IV&V using an independently built system reference model (UML based) of a space vehicle design based on Project artifacts. Its been costly in dollars and in performance. This R&D has taken countless man-hours away from our directive to find issues/problems with S/C FSW development." Continue reading Sudden Management Change at IV&V. By Keith Cowing on December 28, 2009 10:43 AM. "When Texas Sen. John Cornyn recently voted against legislation funding NASA, with its thousands of jobs at Houston's Johnson's Space Center, it caused a bit of a stir back home. After all, the Republican senator always prided himself on being a champion of home-state interests. Even Cornyn readily admits that his vote is an about-face. But there's a clear explanation for the change: Cornyn says he's trying to strike a balance between his dual roles as a senator seeking federal spending in Texas and as an emerging GOP congressional leader fighting to cut government expenditures." By Keith Cowing on December 28, 2009 10:19 AM. "According to the report released this week: "Despite the importance of space to government and commercial activities the U.S. space launch industry has seen a decline in launch services over the past decade . . . From 2004-2008 the U.S. shared of commercial launches was about 17 percent, compared with 42 percent for Russia, 21 percent for Europe and 18 percent for the multi-national company SeaLaunch." "At present, the U.S. space launch propulsion industrial base provides a diverse range of technological capabilities and more than adequate production capacity to meet most currently identified U.S. Government and commercial requirements for space launch vehicles.' Furthermore, there are no articulated, established space launch requirements that are beyond the current development expertise of the U.S. space launch propulsion industrial base. Nonetheless, this U.S. industrial sector is under significant stress, due largely to low demand." NASA TV - Time For an Upgrade? By Keith Cowing on December 27, 2009 3:00 PM. "The man in charge of Washington, D.C.-based NASA Television, executive producer Fred Brown, acknowledges that the network is light-years from where it could be if it had the money and a mandate to properly entertain the masses. But that was never the point, he said. The network was launched in the early 1970s strictly to provide "real-time mission coverage" for NASA's own personnel, Brown said. "It wasn't designed as a television channel as most people would think of a television channel," he added. Over the years, its role has grown; it now offers educational programs and serves a public-relations function by keeping the media informed about space-related news." By Keith Cowing on December 26, 2009 6:52 PM. "Now in its third season, the Discovery Channel's Everest: Beyond The Limit is taking a new approach to filming this year and will feature both International Mountain Guides and Himalayan Experience in a five-part series. IMG climber Scott Parazynski returned to Everest this season after coming tantalizingly close last year. The former Nasa Astronaut was sidelined with a ruptured lumbar disc at 24,500' on his summit bid in 2008. This year Scott came back fit and ready to top out with Danuru Sherpa. Scott achieved his goal at dawn on May 20, 2009. A veteran of several space flights and spacewalks, Scott is the only person to both summit Mt. Everest and fly in space." By Keith Cowing on December 26, 2009 6:01 PM. "S. Neil Hosenball, 84, the general counsel of the National Aeronautics and Space Administration from 1975 until his retirement in 1985, died Dec. 23 at his home in Arlington County. He had cancer. Mr. Hosenball was a 25-year veteran of the space agency, where he became the chief lawyer. He worked on treaties for the peaceful use of outer space, among other issues." By Marc Boucher on December 24, 2009 2:11 PM. Marc's note: NASA Watch will be updating only on a limited basis until next Monday at which time we will resume our normal schedule until New Year's Eve. From New Year's Eve until Monday, January 5th we will once again only be publishing on a limited basis. We wish everyone the best during this holiday season and please do be careful during your travels! By Marc Boucher on December 24, 2009 1:00 PM. "Sir Arthur C. Clarke Law"
"When a distinguished but elderly scientist states that something is possible, he is almost certainly right. When he states that something is impossible, he is very probably wrong." By Marc Boucher on December 24, 2009 12:04 PM. "Stan Lebar, who led the Westinghouse Electric Corporation team that developed the lunar camera that brought the televised news images of Neil Armstrong stepping onto the moon to more than 500 million people on earth, died on Tuesday, Dec. 22, 2009." "During his long and distinguished career, other camera programs he managed for NASA included the Apollo Color TV Cameras, the Skylab series of TV cameras, and the TV cameras for the Apollo-Soyuz Test Program (ASTP)." By Keith Cowing on December 23, 2009 3:57 PM. How Will We Travel to Avatar's Pandora? By Keith Cowing on December 22, 2009 7:01 PM. "Apart from the mundane problems of budgets and political will, the major roadblock is that our dominant space-flight technology - chemically fuelled rockets - just isn't up to the distances involved. We can send robot probes to the outer planets, but they take years to get there. And as for visiting other stars, forget it. As an example of why, the Apollo 10 moon probe is currently listed as the fastest manned vehicle in history, having reached a maximum speed of 39,895 kilometres per hour. At this speed, it would take 120,000 years to cover the 4 light years to Alpha Centauri, the nearest star system." "It's the year 2154 and humankind has reached out to the stars in director James Cameron's new science-fiction epic Avatar. The movie takes us to an exotic jungle moon called Pandora where humans are the aliens and a clash is brewing with the natives." By Keith Cowing on December 22, 2009 2:54 PM. "Rep. Parker Griffith of Alabama, who hails from a heavily conservative congressional district, announced Tuesday that he will join the GOP." "The future of America's space program is solid and safe, even as the White House ponders missions and rocket programs that could be led by Marshall Space Flight Center, U.S. Rep. Parker Griffith, D-Huntsville, said here Friday." By Keith Cowing on December 22, 2009 2:30 PM. "The ISS has been continuously staffed since 2000 and now has a six-member crew. The primary objective for the ISS through 2010 is construction, so research utilization has not been the priority. Some research has been and is being conducted as time and resources permit while the crew on board performs assembly tasks, but research will is expected to begin in earnest in 2010. NASA projects that it will utilize approximately 50 percent of the U.S. ISS research facilities for its own research, including the Human Research Program, opening the remaining facilities to U.S. ISS National Laboratory researchers." "High transportation costs to space and inadequate funding on the ground may prevent NASA from using its expensive orbiting microgravity laboratory -- the International Space Station -- to the full extent, according to the U.S. Government Accountability Office (GAO)." By Keith Cowing on December 22, 2009 12:26 PM. "Perhaps there are no clear answers. All that can be said with any certainty is that NASA and the Goddard Space Flight Center followed all procedures in storing the Apollo telemetry tapes, the search team has concluded. After reviewing their content and determining that Apollo program managers no longer needed the data, Goddard personnel shipped the telemetry tapes to WNRC for storage. Over the ensuing years, Goddard recalled them and either reused the one-inch tapes to meet a network shortage in the early 1980s or disposed of them because of the high cost of storing them. At no time did anyone recognize the unique content on roughly 45 tapes containing the actual moonwalk video. At no time did anyone ever consider what could be possible nearly 40 years into the future with the advent of new technology." By Keith Cowing on December 22, 2009 11:27 AM. "Fearful that the White House might scale back manned space exploration, a bipartisan group of lawmakers slipped a provision into a massive government spending package last week that would force President Barack Obama to seek congressional approval for any changes to the ambitious Bush-era, back-to-the-moon program. The little-noticed legislative maneuver could yield massive payoffs for the Houston area, which has tens of thousands of jobs tied to manned space exploration. The congressional action hands NASA supporters additional leverage in their behind-the-scenes campaign to persuade Obama to budget an extra $3 billion a year to finance the return of astronauts to the moon by 2020 rather than revamping -- and cutting -- the manned space effort." "While no firm decisions have been made and budget numbers remain in flux, there appears to be broad agreement inside the administration over using private rockets and capsules to access the orbiting space station. "There is clearly a recognition that if you want to do that, it should be done seriously and with enough funding" to succeed, according to one senior administration official involved in the deliberations." By Keith Cowing on December 22, 2009 8:52 AM. Keith's note: Earlier this month the LOIRP - Lunar Orbiter Image Recovery Project did a live webcast from Building 596 at NASA Ames Research Park. The project's co-lead Dennis Wingo and myself were the prime participants. 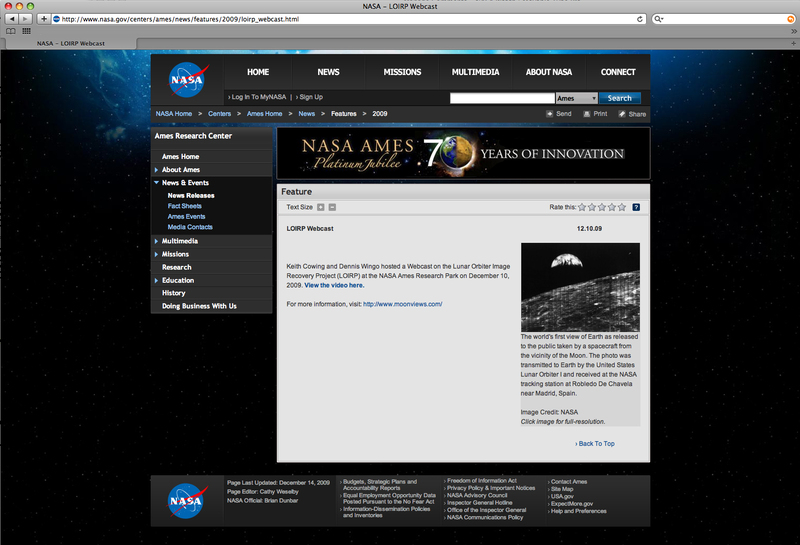 NASA ARC PAO put a terse web page online about the webcast at the last minute. In so doing they used a Lunar Orbiter image. The LOIRP is all about the retrieval and reprocessing of these images in higher resolution than was possible in the 1960s. So, what image (low res and hi res) did ARC PAO use on their webpage? They used a 40 year old blurry, muddy original image - not one of our new crisp ones. It has been two weeks. Either ARC APO is clueless as to what the LOIRP is doing just outside their gates or they are just lazy and do not care to get it right. Go figure. Keith's update: ARC PAO has now added one of the restored images to this webpage. By Marc Boucher on December 21, 2009 7:43 PM. Marc's note: From NASA's Constellation program comes today's video: Constellation Year in Review 2009. It's the holidays and year end so why not a feel good video that showcases all of Constellations achievements with all the centers contributing. After watching the video what do you think of Constellation's progress this past year? Video after the jump. One of our readers was quick to point out that along with the video a new Constellation blog post was posted today stating that they have finalized the thrust oscillation issue fix. "When we discover an engineering risk, like thrust oscillation, we tackle it with full rigor," said Jeff Hanley, Constellation Program manager. "That's what this team has done with thrust oscillation. We assumed the worst when the problem was first discovered. The good news is there is no empirical evidence of problematic oscillations from our ground test of the first stage development motor or during the Ares I-X first test flight." Continue reading Constellation Year in Review Video. By Marc Boucher on December 21, 2009 4:21 PM. "A powerful nor'easter ensured that the Mid-Atlantic and Northeastern United States were cloaked in white on the first day of Northern Hemisphere winter in 2009. This image from the Moderate Resolution Imaging Spectroradiometer (MODIS) on NASA's Terra satellite shows the Chesapeake Bay area on December 21." Marc's update: Keith made it to Chicago and should be headed to DCA sometime today. Marc's update: Keith made it back. By Marc Boucher on December 21, 2009 1:40 PM. Those are two basic tenets of talking to the public about global warming, offered by Mark Serreze, director of the National Snow and Ice Data Center. He spoke at a Thursday morning session on "communicating climate" at the American Geophysical Union's fall meeting in San Francisco." By Marc Boucher on December 21, 2009 12:27 PM. "NASA astronaut T.J. Creamer, Russian cosmonaut Oleg Kotov and Japan Aerospace Exploration Agency astronaut Soichi Noguchi safely launched aboard a Soyuz spacecraft to the International Space Station on Sunday. Liftoff occurred at 3:52 p.m. CST from the Baikonur Cosmodrome in Kazakhstan." By Keith Cowing on December 21, 2009 10:21 AM. Keith's note: This Week in Space With Miles O'Brien is now online. Leroy Chiao, Ken Bowersox, and Mike Griffin are guests. By Keith Cowing on December 21, 2009 9:42 AM. "A report by a respected science publication that said President Barack Obama has decided on a new space policy for NASA may be premature, according to Write Stuff sources. The report, which was posted Thursday night on the "Science Insider" blog at the web site of the journal Science, quoted unnamed sources saying that in a meeting on Wednesday with NASA chief Charlie Bolden, the president decided to add an extra $1 billion to NASA's budget." Keith's note: It would seem that Science Magazine jumped the gun a bit. As is the case with the Orlando Sentinel, NASA Watch sources report that the story published in Science is incomplete and, in some cases, is just plain wrong. Specifically it asserts that a final decision has been made as to what NASA will be told to do. That is not the case. But it is likely that NASA will be getting a budget bump of upwards of $1 billion. After last week's Obama/Bolden meeting, NASA is on the hook from White House to provide additional information between now and January to be factored into the final decision making process. Among other things, these decisions include the fate of Ares 1 and the new path that may be chosen regarding launch vehicle utilization and development. Moreover, sources report that the impetus for this "leak" was someone in or around the White House - someone who is not necessarily all that thrilled with certain options that are on the table. So, in classic Washington style, they leaked someone else's potentially good news - but did so early - and the results were counterproductive. You can be certain that neither the White House or the 9th Floor at NASA HQ are remotely thrilled that this stuff is leaking out this soon given that some final number and policy crunching needs to be done. Having to bat down stories - accurate and inaccurate - serves only to distract them from that process. Given that there is lingering concern in some quarters about NASA's capabilities, seeing this stuff dribble out - regardless of the source(s) works against the agency as it strives to make its case to President Obama. That said, having a high profile meeting at the White House just before Christmas and then expecting everyone to stay silent until the FY 2011 budget comes out in February is unrealistic - and somewhat naive in this day and age since no one can keep their mouth shut any more. By Keith Cowing on December 21, 2009 9:37 AM. "On Memorial Day weekend in 2007, Kelly flew to Indiana to watch the Indy 500 with Giffords, his then-fiance. Kelly listed the purpose of the trip as "Space Flight Readiness Training." NASA later said the flight may have violated the agency rules requiring astronauts "to avoid any appearance of inappropriate use of NASA T-38's" when logging their required monthly flight hours. The trip cost taxpayers almost $9,000." "2. 0-KE.07.0167-S, March 11, 2008, Possible Misuse of NASA Aircrafts/Lisa Nowa k"
On May 7, 2007, Raymond Sander, Johnson Space Center, presented the following scenario to Michael Griffin, NASA Administrator, at an ongoing "Ask the Administrator" meeting: "If 1, as a NASA employee in good standing get involved in some emotional, non lethal altercation and arrested by law enforcements agents in Florida, will NASA quickly dispatch my supervisor in a Government T-38 or equivalent, to represent NASA and assess the matter?" The Administrator responded to this question by answering "No." Keith's note: I find it somewhat annoying that JSC often complains that there is not enough travel money for astronaut appearances and yet astronauts can fly T-38's almost any where they want to since the T-38 air time counts against their flight proficiency. That said, based on my experience, such questionable T-38 usage is the exception - not the rule. But it still happens. By Keith Cowing on December 21, 2009 12:46 AM. "The Obama administration appears set to chart a new course for U.S. space exploration by promoting the use of private companies to ferry astronauts into orbit, according to people familiar with the matter. The controversial plan would mark a trailblazing departure for the nation's space program by allowing a group of closely held start-up companies, for the first time, to compete for a central role in an arena previously dominated by much larger, publicly traded contractors with long track records working for the National Aeronautics and Space Administration." Too Close to NASA For Comfort? By Keith Cowing on December 21, 2009 12:32 AM. "If she were out there asking tough questions about Constellation at the same time she was out there roasting alternatives, people would have a lot less problems with her," said one senior White House official not authorized to speak for the administration. But it was her treatment of Augustine, a highly respected aerospace leader, that most angered White House officials, and even upset the former Lockheed Martin CEO himself." By Keith Cowing on December 21, 2009 12:05 AM. "To maintain a vibrant, innovative program, NASA needs to step up the rate of rocket launchings. It should set a requirement that any new launching system fly once a week, then put out contracts for private companies to design and build rockets that can operate this frequently. By launching early and launching often, NASA could get back in the business of exploring space." By Keith Cowing on December 19, 2009 12:26 AM. Keith's note: I just saw "Avatar" in IMAX 3D. It is simply stunning, utterly convincing, and profoundly immersive. You must see it. This is not a "movie". It is something much more - a paradigm shifter to be certain. By Keith Cowing on December 18, 2009 11:56 AM. "New COE for Commercial Space Transportation Public Meeting - February 9, 2010 The FAA Administrator has concurred with the request to establish a new Center of Excellence (COE) for Commercial Space Transportation (CST) in 2010. On February 9 a public meeting will be held in Washington DC to discuss the FAA COE Program and CST technical requirements. A COE Draft Solicitation will be available for public review prior to the meeting." By Keith Cowing on December 18, 2009 11:34 AM. "Laurie Leshin has been named the new deputy associate administrator of the Exploration Systems Mission Directorate at NASA Headquarters, effective in January. Leshin previously served as the deputy center director for science and technology at NASA's Goddard Space Flight Center in Greenbelt, Md. She has led the formulation of strategy and the start of new missions since 2008 as Goddard's senior scientist, while providing extensive scientific guidance to lunar architecture and other human spaceflight planning activities." By Keith Cowing on December 18, 2009 11:30 AM. "In the new blockbuster Avatar, humans visit the habitable - and inhabited - alien moon called Pandora. Life-bearing moons like Pandora or the Star Wars forest moon of Endor are a staple of science fiction. With NASA's Kepler mission showing the potential to detect Earth-sized objects, habitable moons may soon become science fact." "We discuss the possibility of screening the atmosphere of exomoons for habitability. We concentrate on Earth-like satellites of extrasolar giant planets (EGP) which orbit in the Habitable Zone of their host stars." By Keith Cowing on December 18, 2009 11:29 AM. "Astronomers have announced that they have discovered a "super-Earth" orbiting a red dwarf star only 40 light-years from Earth. They found this nearby planet with a small fleet of ground-based telescopes no larger than those many amateur astronomers have in their backyards. Although the super-Earth is too hot to sustain life, the discovery shows that current, ground-based technologies are capable of finding almost-Earth-sized planets in warm, life-friendly orbits." By Keith Cowing on December 18, 2009 11:15 AM. "NASA's Cassini spacecraft has captured the first flash of sunlight reflected off a lake on Saturn's moon Titan, confirming the presence of liquid on the part of the moon dotted with many large, lake-shaped basins." "Saturn's largest moon, Titan, looks to be the only place in the solar system--aside from our home planet, Earth--with copious quantities of liquid (largely, liquid methane and ethane) sitting on its surface. According to planetary astronomer Mike Brown of the California Institute of Technology (Caltech), Earth and Titan share yet another feature, which is inextricably linked with that surface liquid: common fog." By Keith Cowing on December 18, 2009 9:46 AM. activities performed by the NEACC." By Keith Cowing on December 18, 2009 9:08 AM. "Rep. Parker Griffith, D-Huntsville, is slated to discuss NASA's future Friday in an "all-hands" meeting to be held at Marshall Space Flight Center's auditorium in the headquarters building 4200." By Marc Boucher on December 17, 2009 8:12 PM. "President Barack Obama will ask Congress next year to fund a new heavy-lift launcher to take humans to the Moon, asteroids, and the moons of Mars, ScienceInsider has learned. The president chose the new direction for the U.S. human space flight program Wednesday at a White House meeting with NASA Administrator Charles Bolden, according to officials familiar with the discussion. NASA would receive an additional $1 billion in 2011 both to get the new launcher on track and to bolster the agency's fleet of robotic Earth-monitoring spacecraft." "Among the things Bolden told lawmakers and Congressional staff was that the White House was now favoring a $1 billion top line increase to NASA's budget in 2011. This would be far better than the 5 percent cut that all agencies, including NASA, were asked by the White House to prepare, but difficult to secure given the deficit-cutting mindset in Congress now." By Marc Boucher on December 17, 2009 5:44 PM. "The Yecheon Astro Space Center announced today that it has selected XCOR Aerospace as its preferred supplier of suborbital space launch services. Operating under a wet lease model, XCOR intends to supply services to the Center using the Lynx Mark II suborbital vehicle, pending United States government approvals to station the vehicle in the Republic of Korea." By Keith Cowing on December 16, 2009 11:49 PM. Keith's 15 Dec note: Charles Bolden is scheduled to meet with President Obama at the White House in the oval office on Wednesday at 3:05 pm EST. The topic for discussion is the Augustine Commission's findings and their "non-recommendation recommendations". Keith's 16 Dec update: Don't look for a flurry of press releases, etc. coming from this meeting today. Alas, while many at NASA HQ (and the White House) would prefer that all the details of NASA's new White House direction stay under wraps until the FY 2011 budget comes out in Feb. 2010, it is almost a certainty that things will start dribbling out soon. Stay tuned. Robert Gibbs: I have not gotten a read out from the meeting. But we're trying to see what has come of their discussions. I don't know that we'll have a ton on this today. Obviously, the budget is being put together for next year. I know the most previous budget that was passed represented an increase in spending for NASA - and the President believes that NASA plays a vital role going forward. Robert Gibbs: Let me get a readout from the meeting before I --"
"Administrator Bolden met this afternoon with President Obama in the Oval Office," [NASA Associate Administrator Morrie] Goodman said in an e-mail. "The two discussed the Augustine Commission's study and analysis of the existing space program, which highlighted challenges. They also discussed options for how the country might improve its future human spaceflight activities. "The president re-confirmed his commitment to human spaceflight and space exploration as well as his goal of ensuring that the nation is on a sustainable path to achieving our aspirations in space." By Keith Cowing on December 16, 2009 2:42 PM. Keith's 15 Dec note: All of NASA's field center directors met today in a closed door session in one of the Administrator's Conference Rooms on the 9th floor of NASA HQ. In addition to all of the center directors who were seated around the table, a dozen or so staffers stood around the periphery of the room. Their collective task was to work out and then agree upon a new governance structure for the agency - one that would best implement the new (revised) direction that the White House is providing to NASA. There are apparently 5 or so specific areas that the agency will be re-organizing itself to implement. As such, there may be a recasting of the "directorate" model in favor of "divisions". All of the participants were sworn to secrecy and were not going to be leaving the room until a new governance model was agreed to. What did they decide upon? Stay tuned. Keith's 16 Dec update: Well, despite best intentions, nothing final was worked out in terms of a revised governance structure - but progress was made. This activity will pick up again in earnest after the holidays. By Keith Cowing on December 16, 2009 8:58 AM. By Keith Cowing on December 15, 2009 6:21 PM. "David King, executive vice president of Dynetics, added, "Tim Pickens is one of the most creative, energetic and 'lean thinking' propulsion experts in the United States. He is well known in the local and national space communities. We are excited to bring Tim on board - along with Mark Fisher, who has 20 years of experience in NASA, DoD (Department of Defense) and commercial propulsion and management - as well as the rest of the OPI team." By Keith Cowing on December 15, 2009 6:08 PM. "We don't know yet what the Obama administration has in mind for NASA or how it is going to handle the issue of human space flight. We are sure it will not be canceled, but how will it be advanced? We see two distinct possibilities: a great one that would have us engage the world and several generations to take the next great leap, or a mundane one that would have us locked in Earth orbit with little purpose and a level of risk that exceeds its gain. The 1970s shuttle decision produced a great vehicle and a magnificent technological accomplishment, but ultimately a poor program with no destination and little purpose. We hope this type of decision will not be repeated, and believe that the stage has been set for something much grander." Keith's 14 Dec note: Lou, in your haste to wrap your arms around the as-yet unreleased Obama space plan, you apparently haven't bothered to read up on the decades of human physiology expertise gained from these Space Shuttle (and shuttle-supported ISS) missions of "little purpose" or the immense experience gained in the assembly and operation of large complex spacecraft (the ISS was mostly carried into orbit by the Space Shuttle). Both of these things are needed in order for humans to go to Mars. So, do not be so quick to dismiss the value of the Space Shuttle program. Indeed, it may not be going away entirely (sidemount HLV). "Flexible Path" means that we try many things Lou - not just the one particular destination that you are interested in (Mars). Keith's 15 Dec update: I got a short email today from Lou Friedman: "Did you have a typo in this sentence "the decades of human physiology expertise gained from these Space Shuttle" Did you mean "the decades of human physiology expertise gained from these Soyuz and Mir?" It would seem that Lou is utterly ignorant of the long list of research projects done aboard the Space Shuttle including multiple Spacelab flights, some of which were totally dedicated to human physiology and space life science. As for the quality of Soyuz and Mir research (before the U.S. got involved during shuttle flights, that is), Lou, go talk to a few space life science experts about that and then get back to me. You will find that the quality of that Soviet/Russian research to be somewhat "lacking" to put it kindly. Also, I find it rather bizarre that Lou would characterize the value of the Space Shuttle as he has given that NASA's current Administrator put his life on the line 4 times to fly on it. I (guess) that Lou thinks that the risk that Bolden and his crewmates took was really done for "little purpose" as well. Again, how quickly we forget. Indeed, as is the case in this instance, some people forget on purpose. By Keith Cowing on December 15, 2009 5:45 PM. "NASA's current mission in orbit around the moon, the Lunar Reconnaissance Orbiter, or LRO, has been providing crucial insights about our nearest celestial neighbor since its launch in June. At a scientific meeting today, researchers unveiled the latest findings from three instruments of the powerful suite of seven aboard the satellite. LRO is expected to return more data about the moon than all previous orbital missions combined." By Keith Cowing on December 15, 2009 2:59 PM. "NASA and the Kingdom of Saudi Arabia's King Abdulaziz City for Science and Technology (KACST) have signed a joint statement that allows for collaboration in lunar and asteroid science research. The partnership recognizes the Saudi Lunar and Near-Earth Object Science Center as an affiliate partner with the NASA Lunar Science Institute at NASA's Ames Research Center, Moffett Field, Calif."
By Keith Cowing on December 15, 2009 10:42 AM. "If the debate over NASA's future was a mob war, then U.S. Sen. Richard Shelby took the fight to the mattresses on Monday when the Alabama Republican called for an investigation into how federal lobbyists influenced a presidential space panel. In a letter dated Monday, Shelby contends that federal lobbyists "tainted" the findings of a presidential space panel that suggested scrapping NASA's Constellation moon rocket program in favor of approach that favored commercial rockets and stronger international partnerships." "Shelby managed to restore over $600 million to the program that was cut in the House-passed FY 2010 CJS Appropriations bill, his office said in a prepared statement. Shelby included language that limits NASA's ability to terminate or alter the current Constellation program. This will require the Obama aministration to work with Congress and wait for approval prior to changing any current human exploration plans, Shelby said." "A $1.1 trillion federal spending bill put Alabama's Republican senators at odds this week, with U.S. Sen. Richard Shelby voting for the act in defense of NASA funding and U.S. Sen. Jeff Sessions casting a nay vote because of bloated spending." By Keith Cowing on December 15, 2009 10:29 AM. Keith's note: Looks like NASA made it - twice - into Sen. McCain and Sen. Coburn's "Stimulus Checkup" Press conference and full report. The James Webb Space Telescope, named for a former NASA administrator, will eventually replace the Hubble telescope, and it is getting a major boost from $65 million in stimulus funding for its prime contractor, Northrop Grumman." By Keith Cowing on December 15, 2009 10:21 AM. Continue reading A Closer Look at Sen. Shelby, Money, NASA MSFC, and Lobbyists. By Keith Cowing on December 15, 2009 12:41 AM. "Arcata Associates Inc. plans to issue a Sole Source Request for Quote (RFQ) for Open Source Software to be used at Marshall Space Flight Center (MSFC)." The solicitation focuses on A-RTP protocol Stack XP. You can get it for free here and here. What the solicitation is really after is support and training - not the software. By Keith Cowing on December 15, 2009 12:16 AM. "NASA has launched a new Web site created specifically for teenagers that provides teens access to current NASA spacecraft data for use in school science projects, allows them to conduct real experiments with NASA scientists, and helps them locate space-related summer internships." Keith's note: Nice website. One big problem: no mention of human spaceflight or aeronautics. If NASA is going to launch a site like this it really should be run by the NASA Education Office and it should cover all that NASA does, not some subset thereof. I guess its too much to ask for SMD, ESMD, and SOMD to pool their separate EPO budgets to help the NASA Education Office do something like this - in a coordinated fashion such that all of the things that NASA does are included. (Sigh) more stove pipes. P.S. With regard to the press release title: what sort of clunky grammar is NASA now using? By Keith Cowing on December 14, 2009 6:38 PM. Keith's note: The USAF claims "its not science fiction". So, of course I believe them. Wow, who knew! The USAF has mega comsat battlestars in orbit, their ops personnel wear sleek imperial empire costumes, and they even use the metric system too! Yet when NASA tries to do some harmless education and public outreach, Congress cuts their PAO budget and prohibits them from "lobbying". Sheesh. Continue reading America's Other Space Program Is Very Cool. By Keith Cowing on December 14, 2009 4:50 PM. "Ares I supporters have opposed the panel's findings, saying that Constellation and Ares I are better and safer than any commercial rocket. Until now, however, companies like Boeing have done most of their lobbying behind closed doors despite being urged by some lawmakers to take their cause public. Rep. Gabrielle Giffords, D- Arizona, the head of the House subcommittee with NASA oversight and the wife of NASA astronaut Mark Kelly, says she urged aerospace leaders to get their employees to write the President over the summer, but said only six letters were written. Boeing has the contract to build the upper stage of the Ares I rocket which it is developing with NASA's Marshall Space Flight Center in Huntsville, Alabama." By Keith Cowing on December 14, 2009 4:19 PM. "I am writing with serious concerns regarding the Augustine Commission staff, their vocation, and their conduct while serving as Commission staff. It has come to my attention that several members are, in fact, federally registered lobbyists and that some of these individuals have taken direct advantage of their temporary roles on the Commission to further their personal business. Further, there are lobbyists that worked as Commission staff that are not even acknowledged in the report. This is both disturbing and unconscionable." Keith's note: How curious. Between the sneaky tricks that Shelby's staff are playing behind the scenes with regard to companies and NASA field centers seens as threats to MSFC/Alabama/Ares to the non-stop outstretched hand of Shelby's contribution gravy train. Have a look at this list of companies, PACs, etc. who have donated to Shelby's campaigns. See any familiar names? A potential for bias? Influence by lobbyists? Nah. Perish the thought. Sen. Shelby's campaign certainly does not have a problem taking financial contributions from companies - large and small - many of whom have a direct, substantial financial stake in the Ares 1 program and other programs that Shelby exerts influence over. According to "Top 20 Contributors Senator Richard C Shelby 2005 - 2010" at Opensecrets.org, 5 out of the top 20 of Sen. Shelby's top contributors are Huntsville contractors. Radiance technologies is particuarly dependent on Shelby for handouts and responded with $45,750 in contributions. Dynetics is only #19 with just $19,900 in donations. As for the other local pols, according to "Top 20 Contributors Congressman Robert B Aderholt 2009 - 2010", Dynetics is his #1 contributor having written checks for $10,600 (where Dave King, Steve Cook etc. and other former senior MSFC management now work). And in the 5th Congressional District, incumbent Parker Griffith's (D) 2008 challenger Wayne Parker (R) got $22,300 from Dynetics making them his #1 contributor as well. "The total value of the contract, if all options are exercised, is approximately $335 million." "To NASA critic Keith Cowing the move is duplicitous. "Does Sen. Shelby shun lobbyists?" asked Cowing, who runs the Web site NASAwatch.com. "This is like the pot calling the kettle black. If he has a problem with lobbyists then he should renounce them, give their money back and run on his own merits." "That language, inserted by U.S. Sen. Richard Shelby, R-Ala., should pass this month as part of a nearly $450 billion omnibus appropriations bill. It would require NASA to spend nearly $4 billion on the program this fiscal year, effectively tying Obama's hands as he attempts to forge a new NASA policy that is likely to cancel Constellation's Ares I rocket. According to industry sources, U.S. Rep. Alan Mollohan, D-W.Va., also signed off on the language, at the urging of U.S. Reps. Bart Gordon, D-Tenn., and Gabrielle Giffords, D-Ariz. Mollohan heads the appropriations subcommittee that handles NASA, while Gordon and Giffords have oversight responsibility for the agency. "They are at an impasse," said space historian Roger Launius of the Smithsonian National Air and Space Museum. "And unless the White House levels enough pressure, Congress could prevail." A checkmate is exactly what Shelby wants, as the veteran lawmaker has been a ceaseless protector of NASA's Marshall Space Flight Center in Alabama and its thousands of Constellation-related jobs." By Keith Cowing on December 14, 2009 12:55 PM. "NASA's Wide-field Infrared Survey Explorer, or WISE, lifted off over the Pacific Ocean this morning on its way to map the entire sky in infrared light. A Delta II rocket carrying the spacecraft launched at 9:09 a.m. EST from Vandenberg Air Force Base in California. The rocket deposited WISE into a polar orbit 326 miles above Earth." By Keith Cowing on December 13, 2009 7:20 PM. "... And yet my boys are in love. They ask for library books about outer space. They had a DVD of the moon landing. They go to the local planetarium. They recite facts about planetary gasses and burned-up stars and black holes and something else called a white hole. "Mom, did you know?" they ask before launching into a minilecture. I never do. Nor, if I'm honest, do I care to find out. The other day, Eli interrupted himself in the middle of a shooting star explanation and said, sagely, "Mom, sometimes you don't really listen to me." This leaves me with a guilty question: What do you do when your children's interests don't match your own? Do you do your utmost to cultivate genuine enthusiasm and expertise? Do you fake it? Or do you keep the faith with your own passions, figuring you're teaching a lesson about assertion of selfhood and independence?" By Keith Cowing on December 13, 2009 7:03 PM. "A key spending bill that goes before the full Congress this week includes almost $90 million directly for Redstone Arsenal and Marshall Space Flight Center projects - including work on lunar landers and FBI explosive disposal research." "After months of fighting for the North Alabama space community, it is a tremendous victory to see critical funding restored to Marshall Space Flight Center, Ares, and Constellation," Griffith said. "This bill not only saves but guarantees the survival of the safest, most advanced and most efficient vehicle we have at NASA." By Keith Cowing on December 13, 2009 6:26 PM. "One of the projects Nebula has been very excited to support enables the public to view and explore the surfaces of the Moon and Mars in unprecedented resolution in both Google Earth and Microsoft World Wide Telescope. The NASA team responsible for these projects leveraged Nebula to perform sophisticated large-scale image processing and hosting of hundreds of thousands of high-resolution images and over 100 terabytes of data." Will White House Speak Soon About NASA? By Keith Cowing on December 12, 2009 1:20 PM. "Congress and the White House have signaled that they envision sharply different futures for NASA and its manned space mission. At an aerospace luncheon, NASA Administrator Charlie Bolden said President Barack Obama wants the agency to embrace "more international cooperation" after the space-shuttle era ends in 2010 and hinted that its Constellation moon-rocket program could see major changes. "We are going to be fighting and fussing over the coming year," Bolden told an audience of aerospace executives and lobbyists Wednesday. "Some of you are not going to like me, because we are not going to do the same kind of things we've always done." But hours earlier, congressional appropriators reached a different conclusion, approving legislative language declaring that any change to Constellation, which aims to return astronauts to the moon by 2020 but is running well behind schedule, must first get the approval of Congress." Keith's note: Charlie Bolden cancelled a speech that he was supposed to deliver in San Diego today at the last minuute to stay in Washington. All NASA field center directors meet early next week with Bolden. Something is up. According to a Twitter post by Erika Wagner who attended an appearance by Norm Augustine at MIT last night "Augustine: "I'm told that some of the decision documents are on [Obama's] desk right now"
By Keith Cowing on December 11, 2009 4:50 PM. By Keith Cowing on December 11, 2009 10:47 AM. "AIAA President Dave Thompson today testified before the House Committee on Science and Technology on "Decisions on the Future Direction and Funding for NASA: What Will They Mean for the U.S. Aerospace Workforce and Industrial Base?" Thompson and his fellow panelists were asked to address the effects of NASA's future direction and funding on the country's aerospace industry and the nation as a whole." "U.S. preeminence in aerospace is threatened by aging demographics and uncertainty over the future of the U.S. space program and adequate funding to support it, AIA President and CEO Marion Blakey said Thursday in testimony before the House Committee on Science and Technology." "Contact your elected officials and let them know that NASA and its space exploration programs are on the right trajectory. As the President and Congress weigh the options for our nation's future space exploration policy, it's important our elected officials know that you support the Constellation and Ares rocket programs." By Keith Cowing on December 10, 2009 2:38 PM. Keith's note: On Thursday, 10 December 2009, we'll be doing a live webcast from the Lunar Orbiter Image Recovery Project (LOIRP) at "McMoon's" i.e. Building 596 at the NASA Ames Research Park. Keith's update: The webcast has been archived below. Continue reading Live Webcast From The Lunar Orbiter Image Recovery Project. By Keith Cowing on December 9, 2009 11:52 PM. "Today, December 9, NASA Administrator Charlie Bolden addressed a joint luncheon organized by Women in Aerospace and the American Institute of Aeronautics and Astronautics. Lori Garver gave a friendly introduction to Bolden noting that he was two star Marine General and a four time astronaut. A friend of Bolden's named Rocky told Lori "You have won the lottery." Charlie then stepped to the podium. He began by stating that it was an honor to be here. He added that Lori was a key member of his team. The numbers of women in aerospace today is a tribute to the work of WIA in the past two decades. He also acknowledged the presence of AIAA President Dave Thompson." By Keith Cowing on December 9, 2009 11:44 PM. "Around NASA, he's known as "the Hubble Repairman." And last May, on his third visit to the orbiting space telescope, John Grunsfeld pulled off the repair to end all repairs. Working at zero gravity some 350 miles above the surface of the Earth, the astronaut restored sight to a half-blind Hubble--called the greatest scientific instrument ever invented--and ensured that it will continue to send back the stunning images and mind-boggling data that have transformed our understanding of the universe." By Keith Cowing on December 9, 2009 11:16 PM. By Keith Cowing on December 9, 2009 1:46 PM. Keith's note: These images are taken from Lunar Orbiter II image LOII_092H1 Framelet 522. On the left is the highest resolution scanned version available online at LPI (or USGS). On the right is our partially processed version that we retrieved this morning. In addition to providing a much sharper image, note that our new image also allows contrast to be controlled such that features can seen in the areas that are darkened in the older image. More information and high res images. By Keith Cowing on December 9, 2009 1:11 PM. "Two veteran aerospace communicators will lead the Coalition for Space Exploration's Public Affairs Team in 2010. Aerojet's Glenn Mahone and Jacobs Technology's Jeannie Kranz were recently named the organization's new chair and deputy chair, respectively. Each will serve a one-year term, effective January through December 2010." By Keith Cowing on December 8, 2009 11:08 PM. Reader's note: I believe your posting in regard to this topic and the comments it has generated have missed the mark given that the original reason for this survey as conveyed in the e-mails announcing it has not been included. The real question that should be asked is what in the world does any of this have to do with the "Langley Message?" Continue reading LaRC internal Poll Update. By Keith Cowing on December 8, 2009 3:35 PM. "In conjunction with this RFI, NASA will conduct an open workshop tentatively scheduled for February 16-18, 2010 to bring potential users and providers of on-orbit servicing capabilities together with the NASA study team. The study team will present the notional mission definition process and the first draft of the notional mission suite. RFI responders will have an opportunity to present ideas, technologies and capabilities as well as forecast existing and planned spacecraft/observatories that would benefit from on-orbit serviceability. The study team will then finalize the notional missions based on the RFI responses and the presentations and discussions at this workshop." By Keith Cowing on December 8, 2009 11:56 AM. "Additional Details: Spacebook was launched in June 2009 and now has over 850 users across NASA." Keith's note: For an agency that has tens of thousands of employees inside the firewall, you (at least) need a zero on this number in order to call it a success - especially when you consider what these employees (and their kids) use out in the real world. Then again, it is a good start. I can clearly recall what it took back in the 80's for my supervisors at NASA to start using email - personally (instead of having their secretaries check it once a week). By Keith Cowing on December 8, 2009 1:09 AM. Keith's note: Tonight we are testing out our newest Mac computer at the Lunar Orbiter Image Recovery Project located at NASA ARC. We'll be using this machine (8 processors and 10 TB of storage) to do near-real time processing of imagery once we have pulled it off of original Lunar Orbiter analog data tapes using our restored FR-900 tape drives. We hope to do a live webcast this coming Thursday so that you can look over our shoulders as we bring another image to light for the first time in more than 40 years. As we were flying through a portion of one of the images we came across a boulder field. The image was taken by Lunar Orbiter II on 20 Nov 1966 at an altitude of 52.2 miles with a ground resolution of 1.14 meters/pixel. The framelet image shown here is approximately 220 meters across. You can clearly make out a number of boulders around 1 meter in size sitting on the surface. By Keith Cowing on December 7, 2009 11:24 PM. "SpaceShipTwo will be unveiled after darkness has fallen over the Mojave Desert to the sound of a space-themed anthem from Britain's biggest DJs, Above & Beyond. Fittingly titled "Buzz" the track will sample Buzz Aldrin's original moon landing dialogue. Following the naming by Governors Richardson and Schwarzenegger, the DJs will also perform an exclusive set at the celebration cocktail party which will follow and feature the first ever IceBar in the desert hosted by Absolut and the world famous Swedish IceHotel. All the guests will be protected from the desert cold by designer space jackets supplied by PUMA. Finally, to close off the celebrations, all the guests will have the opportunity to view the stunning night skies using specialist telescopes supplied by Ron Dantowitz of the Clay Observatory whose unique tracking cameras followed SS1 into space during the epic flights of 2004." Continue reading Big Party in The Mojave Tonight. By Keith Cowing on December 7, 2009 6:46 PM. "There's one other wrinkle to the story: Petruna sent the e-mail out from an account marked "Petruna, Tedd J. (JSC-DX12)[RAYTHEON TECHNICAL SERVICES COMPANY]." Raytheon partners with NASA on the Neutral Buoyancy Lab, where Petruna is a diver. And Petruna told us he works for Raytheon as well as NASA. But Raytheon spokesman Jon Kasle tells TPMmuckraker, "This individual is not a Raytheon employee." Kasle says he's not sure why Raytheon's name is on Petruna's e-mail account, and declined to comment on whether the company is looking into the matter." By Keith Cowing on December 6, 2009 6:36 PM. "In this Request for Information (RFI), the NASA Ames CRuSR Office is requesting technical and programmatic input to improve the government's understanding of flight opportunities to aid potential science investigators in scoping and designing possible future suborbital investigations. Responses to this RFI are welcome from all interested parties, especially potential providers of suborbital spaceflight services. Suborbital spaceflight service providers should consider accommodation of flight experiments that address any of the following research disciplines: ..."
By Keith Cowing on December 6, 2009 3:07 PM. Continue reading NASA LaRC Poll: Helping People Feel Attractive and Lovable (#21). By Keith Cowing on December 4, 2009 4:00 PM. "It only took about half as long to get to the moon as it has taken to clean up NASA's financial performance, but three tries, hundreds of millions of dollars and the hard work of many NASA employees later they have shown definite improvement," said Subcommittee Chairman Brad Miller (D-NC). "I feel the responsibility of ensuring that NASA is a good steward of the resources they are given--resources which ultimately come from the American taxpayers," said Subcommittee Chairwoman Gabrielle Giffords (D-AZ)." By Keith Cowing on December 4, 2009 11:42 AM. Keith's note: NASA Watch is now available on Kindle. According to Amazon.com: "Kindle Blogs are auto-delivered wirelessly to your Kindle and updated throughout the day so you can stay current. It's risk free--all Kindle Blog subscriptions start with a 14-day free trial. You can cancel at any time during the free trial period. If you enjoy your subscription, do nothing and it will automatically continue at the regular monthly price. Don't have a Kindle? Get yours here." You can subscribe to NASA Watch on Kindle here. By Keith Cowing on December 4, 2009 11:16 AM. 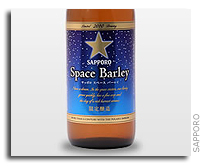 "The "space barley" used to make this beer is the fourth generation descendant of the Haruna Nijo malting barley that was developed by Sapporo Breweries and kept in space for five months during 2006 as part of our collaborative research with the Russian Academy of Sciences and Okayama University with the purpose of achieving self-sufficiency in food in the space environment. Since Sapporo Breweries was founded, we have continued to create excellent varieties for raw materials, and we are the only company in the world that operates breeding/research organizations for both barley and hops. This, the world's first sale of this "space beer," is the result of our extended nurturing/development of the required technologies." By Keith Cowing on December 4, 2009 9:55 AM. "The 2010 NASA Moon Work engineering design challenge seeks to motivate college students by giving them first-hand experience with the process of developing new technologies. To participate in the contest, students will submit their original design for tools or instruments that can help astronauts live and work on the moon. Top-ranked students will be offered a chance to intern with a team from NASA's Exploration Technology Development Program." By Keith Cowing on December 4, 2009 12:00 AM. "The buyout application period begins November 9, 2009, and will continue through 4:30 p.m., Friday, December 11, 2009. Acceptances/Rejections will be issued each Monday for applications received by the close of business on the preceding Friday. Although we expect that all interested persons can be accommodated, the number of opportunities is limited and varies by occupation and organization." By Keith Cowing on December 3, 2009 11:46 PM. "Space Exploration Technologies (SpaceX) recently conducted its first Dragon spacecraft operations training for a group of NASA astronauts and personnel at its corporate headquarters in Hawthorne, CA. The October training focused on how the crew will interface with the Dragon spacecraft while it is approaching and berthed to the International Space Station (ISS). Three of the participating astronauts--Tracy Caldwell Dyson, Shannon Walker and Douglas Wheelock--will be on board the ISS when Dragon makes its first visit under the Commercial Orbital Transportation Services (COTS) program." "Interesting to note that one of the other astronauts in attendance, Marsha Ivins, helped designed NASA's Ares I rocket and was a key architect of the agency's Constellation Program to return astronauts to the moon in 2020. She is well-known opponent to the idea of scrapping Ares I and relying on companies like SpaceX to take crew back and forth to the space station." By Keith Cowing on December 3, 2009 5:13 PM. "NASA's Marshall Space Flight Center in Huntsville, Ala., has awarded a contract to Dynetics Inc. of Huntsville to provide information technology services at the center. The cost-plus-fixed-fee contract begins Feb. 1, 2010, with a two-year base period. The contract may be followed by a two-year option and a one-year option, exercised at NASA's discretion. The total value of the contract, if all options are exercised, is approximately $335 million." "Steve Cook, who has served as manager of Ares projects for NASA Marshall SpaceFlight Center since 2005, has been hired as our new Director of Space Technologies. He will begin his duties at Dynetics on 14 September 2009." "David King, director of NASA's Marshall Space Flight Center in Huntsville, Ala., is retiring from the agency to accept a position as executive vice president of Dynetics in Huntsville, effective immediately." Why Does it Take 2 Years For GSFC To Respond to a FOIA Request? By Keith Cowing on December 3, 2009 5:00 PM. "Mark Hess, public affairs director for the Goddard Space Flight Center which runs the GISS laboratory, said they are working on Mr. Horner's request, though he couldn't say why they have taken so long. "We're collecting the information and will respond with all the responsive relevant information to all of his requests," Mr. Hess said. "It's just a process you have to go through where you have to collect data that's responsive." He said he was unfamiliar with the British controversy and couldn't say whether NASA was susceptible to the same challenges to its data. The White House has dismissed the British e-mails as irrelevant." "The Washington Times reported Thursday that Christopher Horner, a fellow with the Competitive Enterprise Institute, has given NASA until the end of the year to grant his two-year-old Freedom of Information Act request for research detailing NASA's climate data and explaining why the agency has altered its own figures." "The e-mails do nothing to undermine the very strong scientific consensus . . . that tells us the Earth is warming, that warming is largely a result of human activity," Jane Lubchenco, who heads the National Oceanic and Atmospheric Administration, told a House committee. She said that the e-mails don't cover data from NOAA and NASA, whose independent climate records show dramatic warming. By Keith Cowing on December 2, 2009 3:48 PM. Keith's note: I just got this from the organizers of the AAS event Imagine '09 behing held 2-3 December. Portions of the event will be webcast live here. Agenda and other event details can be found here. By Keith Cowing on December 2, 2009 3:42 PM. "A congressional hearing on astronaut safety turned into a pep rally for NASA's troubled Constellation moon-rocket program, with lawmakers and witnesses endorsing it as the best replacement for the space shuttle even as critics complained the hearing was one-sided. ... The one-sided panel of witnesses didn't escape the notice of U.S. Rep. Dana Rohrabacher, R-Calif. "I think that we did need a little more diversity on the panel," he said. "When people like myself are probing ... we [need] to have someone there who would keep everybody honest." By Keith Cowing on December 2, 2009 3:15 PM. "In overseeing the commercial space launch industry, including the safety of space tourism, FAA faces several challenges. These include maintaining a sufficient number of staff with the necessary expertise to oversee the safety of launches and spaceport operations; determining whether FAA's current safety regulations are appropriate for all types of commercial space vehicles, operations, and launch sites; developing information to help FAA decide when to regulate crew and passenger safety after 2012; and continuing to avoid conflicts between FAA's regulatory and promotional roles." By Keith Cowing on December 2, 2009 2:00 PM. "In an e-mail to the Orlando Sentinel, Jeff Hanley, manager of the Constellation Program that includes Ares I and Orion, said that in the four years since the ESAS was first conducted, there have been advances in engineering risk assessments and that supercomputer analyses say that the ultimate risk of losing a crew aboard Ares I would be just 1-in-2,800. But he acknowledged that even with better risk-assessment techniques and designs, a new rocket poses considerable risk. "What at least some of our work suggests is that, yes, on the second launch the LOC [loss of crew] risk may be roughly on par with today's mature shuttle risk. Other assessments are less rosy (a little riskier than a shuttle launch), so we are working right now to sort out a 'best estimate,'' he wrote." "NASAWatch.com,a respected watchdog website,reported on Tuesday night that NASA allegedly withheldinformation from a White House panel that showedthe Ares I rocket did not meet the agency's own safety goals." "Fragola said that the passage quoted by the Sentinel storyfrom the Exploration Systems Architecture Study concluding that it would take at least seven flights (two test flights and five mission flights) before the Ares I and Orion crew capsule could to be deemed to be as safe as the shuttle referred to a more powerful configuration of Ares-Orion that used a liquid oxygen-methane engine and not the simpler lower performance configuration being designed today. He said he knew this because he wrote the section of the ESAS that the Sentinel was referring to. Indeed, the report does say a few pages before the passage quoted by the Sentinel that a LOX-methane engine is riskier than the original simpler design for Ares-Orion, however, Fragola either misremembered the report or was not entirelyhonest with Congress when he dismissed our reporting." Keith's note: With regard to Jeff Hanley's current comments, this is not the first time that Hanley's organization has had problems presenting (or admitting) a consistent view of what Ares 1's safety was relative to Shuttle and other launch systems. Indeed, you only have to look at Joseph Fragola's presentation to the Augustine Committee to see what Constellation knew Vs what it said. Specifically, there was a briefing chart that was withheld from the Augustine Committee - see below for that chart. Continue reading Hanley Changes His Story On Ares 1 Safety - Again. The Outpost Tavern is Closing - And this time, it is for good. By Keith Cowing on December 1, 2009 8:23 PM. "Together, Gene Ross, my mother, Sharon, and myself, have kept the Outpost Tavern going for the last thirty years, it has stayed open. My Mom and Gene being the bulk of it, I was meant to be the "Closer" of this deal! J Good or bad, whatever anyone thinks of how we did it, we kept it open for you! However, like many good things in life, sometimes "we" are not in charge. In this case, the property that the OP sits on has been going through many changes ownership-wise, since Pete Wright died, and there has always been a certain air of uncertainty about what may happen in the future. Well, the future is here. I have been informed that the property has been sold to another party." Continue reading The Outpost Tavern is Closing - And this time, it is for good..
By Marc Boucher on December 1, 2009 2:20 AM. "Canadian Space Agency Flight Engineer Robert Thirsk, Expedition 21 Flight Engineer and Soyuz Commander Roman Romanenko and European Space Agency Flight Engineer Frank De Winne undocked their Soyuz spacecraft from the station at 10:56 p.m. EST Monday and landed in Kazakhstan at 2:15 a.m. Tuesday, 1:15 p.m. local Kazakhstan time. The Soyuz spacecraft landed upright which helped the search and recovery teams extract the astronauts." This page is an archive of entries from December 2009 listed from newest to oldest. January 2010 is the next archive.